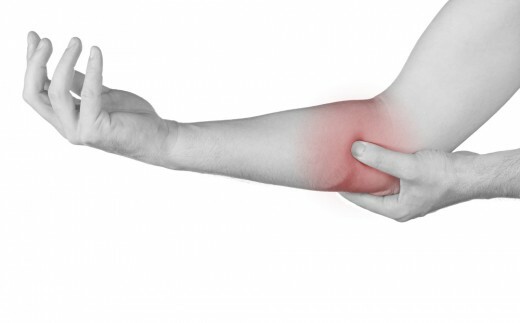 In the acute stage, as already discussed in my previous article, it is always advisable to avoid any activity including therapeutic exercises that may cause or enhance the symptoms of Golfer’s Elbow, especially pain. Once the acute stage has subsided, one can think of starting suitable therapeutic exercise program for the elbow and the wrist. To start with, pain free active and carefully guided pain free range of motion exercises for the elbow are preferred. These exercises may be slowly and gently progressed to stretching exercises. Care should be taken that even the stretching exercises must be done within the limits of severe pain. If strenuous and painful exercises are attempted, they may cause further damage to the already injured Common Flexor Tendinous Sheath and also at the site of its attachment to the medial epicondyle. a. To maintain the range of motion of the elbow joint and the radio-ulnar joints of the forearm. b. To stretch the muscles, the tendons, the ligaments, the fascia and the joint capsule around the elbow joint. c. To maintain the blood circulation in the forearm. d. To maintain the tone of the muscles of the forearm. e. To maintain the strength of the muscles of the forearm. 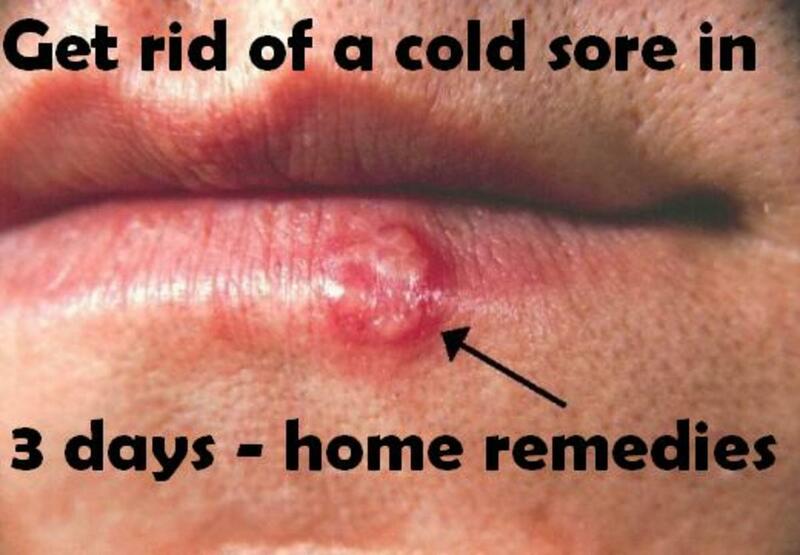 f. To reduce the muscle spasm and hence the pain. g. To prevent the wasting of the muscles of the forearm. 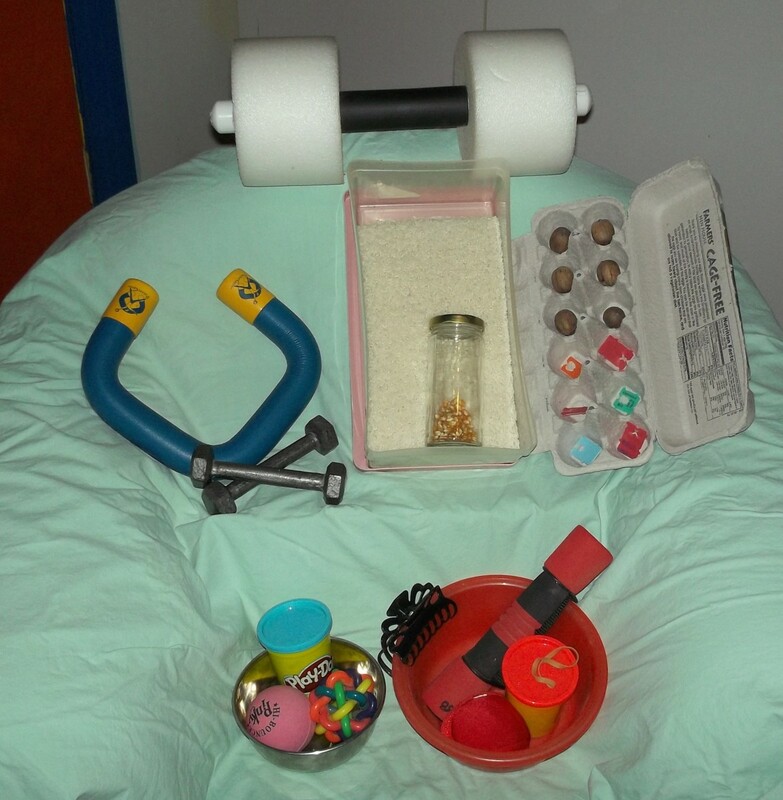 To start with pain free movements and pain free therapeutic exercises of small amplitudes are advisable. Anyway the amplitude of the exercises may be slowly and gradually increased. In this article I would like to discuss a few exercises that may be helpful to relieve the symptoms of Golfer’s Elbow. Before resorting to the exercise program, the advice of a qualified physiotherapist may be sought. Let the patient has Right Golfer’s Elbow. The patient sits at the edge of a bed with the legs hanging down and the right hand resting on the bed. The patient extends (straightens) his right wrist and keeps the palmar aspect of the right hand on the bed with the fingers extended (straightened). Now the right elbow is extended (straightened) so that a stretch is felt along the flexor aspect (front side) of the right forearm. Now the patient extends (straightens) the right wrist further so that the palmar aspect of the right hand and the fingers are off the bed (the right wrist still on the bed), with the fingers still in extension. This position gives a further stretch to the muscles on the flexor aspect (front side) of the right forearm. Hold the right wrist in the maximum stretched position for 3 seconds. Now slowly and gently return back to the starting position. Repeat the exercise 10 times, thrice a day. While doing the exercise, avoid severe pain. The patient lies supine (lying with the face upwards) with the upper limbs extended and kept by his sides with the palmar aspects of the hands and fingers facing downwards. Now extend the right wrist by lifting up the right hand off the bed with the fingers kept straight. Now the right elbow is extended (straightened) so that a stretch is felt along the flexor aspect (front side) of the right forearm. Now hold the right hand with the left hand in such a way that the palmar aspect of the left hand lies on the palmar aspect of the right hand and the left thumb lies on the dorsal aspect of the right hand. Now pull the right hand upwards by the left hand so that a further stretch is felt along the flexor aspect (front side) of the right forearm. Hold the right wrist in the maximum stretched position for 3 seconds. Now slowly and gently return back to the starting position. Repeat the exercise 10 times, thrice a day. 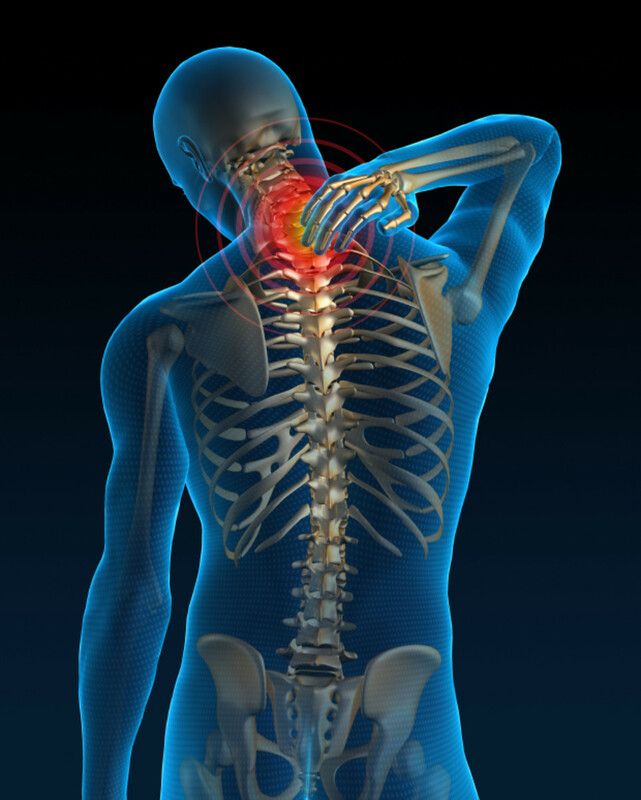 While doing the exercise, avoid severe pain. The patient stands relaxed with the feet apart and the upper limbs hanging down. Bring the extended right upper limb towards the front and is held in the midline in such a way that the right hand is at the level of the lower abdomen. Now extend the right wrist by lifting up the right hand with the fingers kept straight. Now the right elbow is extended (straightened) so that a stretch is felt along the flexor aspect (front side) of the right forearm. Now hold the right hand with the left hand in such a way that the palmar aspect of the left hand lies on the palmar aspect of the right hand and the left thumb lies on the dorsal aspect of the right hand. Now pull the right hand upwards by the left hand so that a further stretch is felt along the flexor aspect (front side) of the right forearm. Hold the right wrist in the maximum stretched position for 3 seconds. Slowly and gently return back to the starting position. Repeat the exercise 10 times, thrice a day. While doing the exercise, avoid severe pain. The patient sits on a chair in front of a table facing it. He keeps his bend right elbow on the table in such a way that the elbow is bent approximately to 45 degrees and the palmar aspect of the right hand is facing upwards with the fingers extended (straight). Let the right wrist is flexed (bend) approximately to 90 degrees with the fingers still in extension (straight). Flex (bend) the right wrist further with the fingers still in extension till the maximum upward range is attained. Hold in the maximum attained position for 2 seconds. Slowly and gently return back to the starting position. Repeat the exercise 10 times, thrice a day. 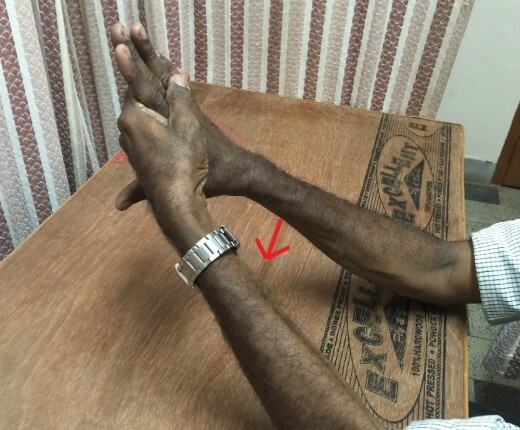 The patient sits on a chair near a table facing it .The patient keeps his bend right elbow on the table in such a way that the elbow is bend approximately to 45 degrees and the palmar aspect of the right hand is facing upwards with the fingers extended (straight). Now extend the right wrist (bring the right hand downwards) approximately to 90 degrees with the fingers still in extension (straight). Now the patient holds a stick at its middle with his right hand in such a way that the stick is horizontal and almost parallel to the floor. 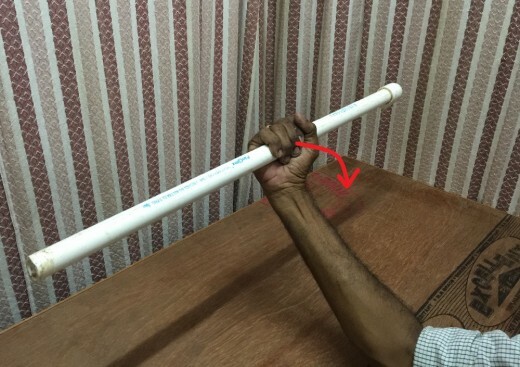 Now the patient flexes (bends) the right wrist along with the stick which is already held in his right hand till a maximum upward range is attained. Hold the right wrist in the maximum attained position for 2 seconds. Slowly and gently return back to the starting position. Repeat the exercise 10 times, thrice a day. The weight of the stick must be such that it’s lifting up does not cause much strain to the wrist. The patient sits on a chair near a table facing it. 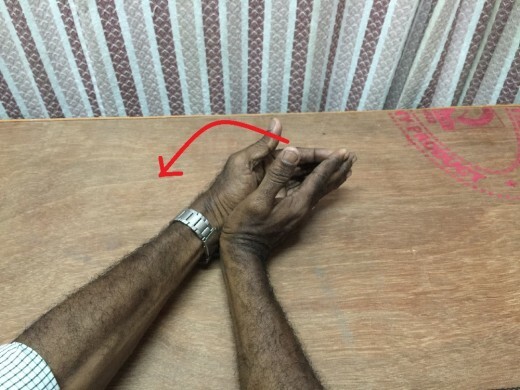 The patient keeps his bend right elbow on the table in such a way that the elbow is bend approximately to 45 degrees and the palmar aspect of the right hand is facing upwards with the fingers extended (straight). Now extend the right wrist (bring the right hand downwards) approximately to 90 degrees with the fingers still in extension (straight). 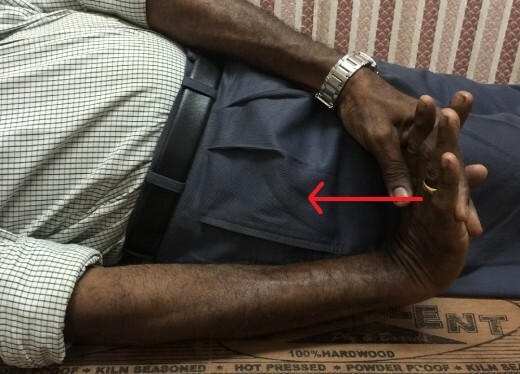 Now the patient holds his right hand with his left hand in such a way that the fingers of his left hand lies on the dorsal aspect (back side) of the right hand and the left thumb lies on the palmar aspect (front side)of the right hand. 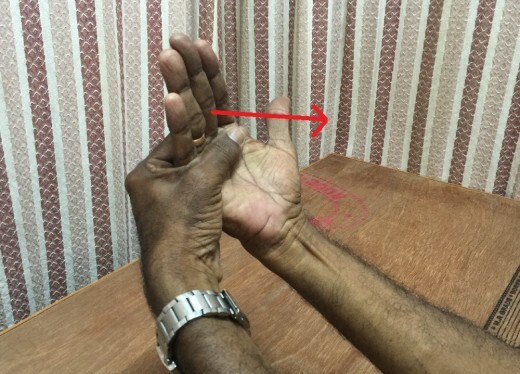 Now the patient lifts up the right hand with the fingers still in extension (straight) to which a minimum resistance is offered by the left hand. The resistance offered must be slow, graded and gentle so that it does not cause any discomfort to the right wrist. Hold the wrist in the maximum attained upward position for 2 seconds. Repeat the exercise 10 times, thrice a day. As a progression the resistance may be increased in a graded manner. The patient sits on a chair near a table facing it. The patient keeps his bend right elbow and the right forearm on the table in such a way that the ulnar border of the forearm rests on the table, with the fingers extended (straight). Now extend the right wrist (take the right hand outward) approximately to 90 degrees, with the fingers still in extension (straight). Now place the palmar aspect of the left hand on the palmar aspect of the right hand in such a way that they lie parallel to each other ie. The fingers of both hands lie parallel to each other. Now the patient flexes (bends) his right fingers to which a minimum resistance is offered by the left hand. Once all the fingers are flexed (bend), the right wrist is also flexed (bend) to which also a minimum resistance is offered by the left hand. This process is continued till the right fingers and the right wrist reach the maximum degree of flexion (bend). The resistance offered by the left hand must be gradual, slow and graded so that it does not cause much discomfort to the right fingers or the right wrist. Hold the right fingers and the right wrist to the maximum attained flexed (bend) position for 2 seconds. Slowly and gradually return back to the starting position. Repeat the exercise 5 times, thrice a day. As a progression, the resistance may be increased in a graded manner. The patient sits on a chair near a table facing it. 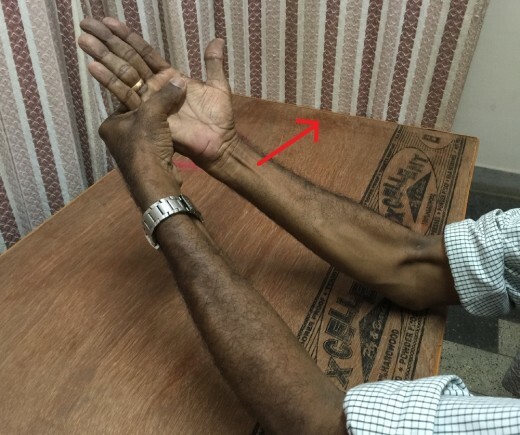 The patient keeps his bend right elbow on the table in such a way that the right elbow is flexed (bend) approximately to 45 degrees with the anterior surface (front side) of the right forearm and the palmar aspect (front side) of the right hand facing upwards. The right wrist and the right fingers are held straightened. Now the patient holds the right hand with his left hand in such a way that the fingers of his left hand lies on the dorsal aspect (back side) of the right hand and his left thumb lies on the palmar aspect (front side) of his right hand. 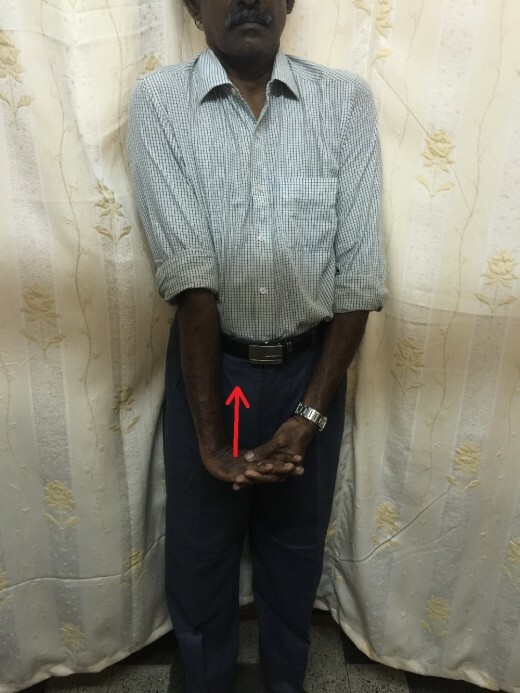 Now the patient tries to flex (bend) his right elbow (the right elbow and the right fingers still held straightened) to which a resistance is offered against the ‘bending force’ by his left hand which is holding it.ie. The effort of the patient to flex (bend) the right elbow is opposed by an equal and opposite force (resistance) offered by the left hand which is holding the right hand. Hence no movement occurs at the right elbow. But the muscles on the flexor aspect (front side) of the right forearm contract isometrically. Muscles contract without movement occurring at the elbow. Hold the right forearm in the maximum contracted position for 2 seconds. Now relax. Repeat the exercise 5 times, thrice a day. Repeat the same exercise holding the right elbow at varying degrees of flexion. The patient sits on a chair near a table facing it. 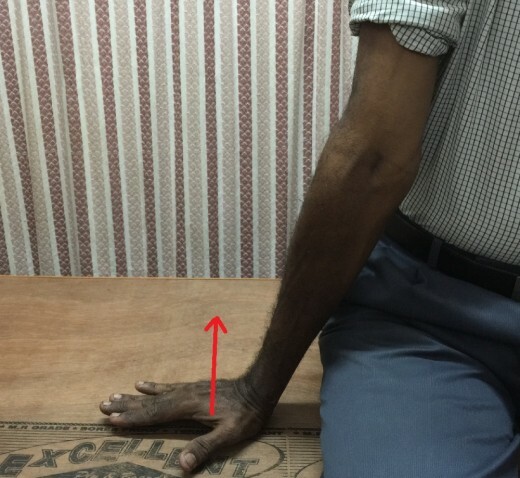 The patient keeps his bend right elbow on the table in such a way that the right elbow is flexed (bend) approximately to 45 degrees with the anterior aspect (front side) of the right forearm and the palmar aspect (front side) of the right hand facing downwards. The right wrist and the right fingers are held straightened. 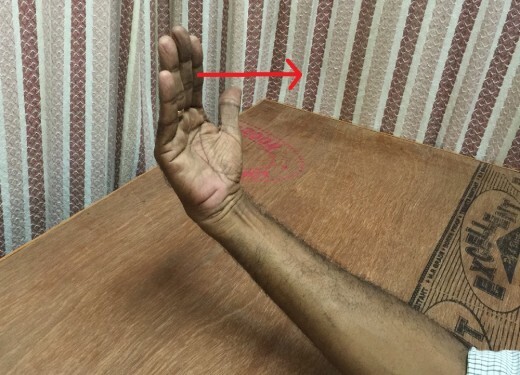 The patient holds his right hand with his left hand in such a way that the fingers of his left hand lies on the palmar aspect (front side) of the right hand and his left thumb lies on the dorsal aspect (back side) of his right hand. Now the patient tries to extend (straighten) his right elbow (the right wrist and the right fingers still held straightened) while a resistance is offered against the ‘straightening force’ by his left hand which is holding it. Ie. The effort of the patient to straighten the right elbow is opposed by an equal and opposite force (resistance) offered by the left hand which is holding it. Hence no movement occurs at the right elbow joint. But the muscles on the flexor aspect (front side) of the right forearm contract isometrically. Ie. The muscles contract without movement occurring at the right elbow. Hold the right forearm in the maximum contracted position for 2 seconds. Now relax. Repeat the exercise 5 times, thrice a day. Repeat the same exercise with the right elbow at varying degrees of flexion.